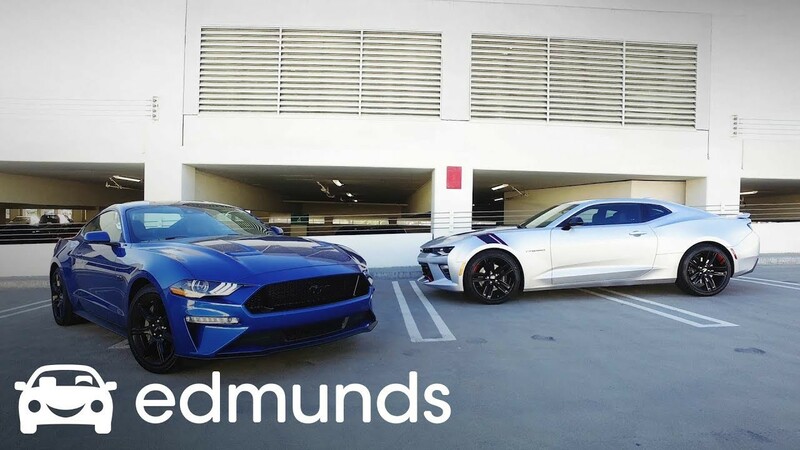 Edmunds editors pit the 2018 Ford Mustang GT (5.0-liter V8) and 2018 Chevrolet Camaro SS (6.2-liter V8) against each other in a comparison test of the longtime pony car rivals. Q: What are the 0–60 numbers for the 2018 Camaro and Mustang? A: In this comparison test, the 2018 Ford Mustang GT sped to 60 mph in 4.6 seconds. The 2018 Chevrolet Camaro SS reached 60 mph in 4.7 seconds. Q: How much is the 2018 Ford Mustang GT? A: The Mustang GT starts around $36,000 and adds some exterior body enhancements and a limited-slip differential. Our GT Premium test vehicle was well-appointed with options such as the 10-speed automatic transmission ($1,695) and an active performance exhaust ($895) pushing its as-tested price to almost $49,000. Q: How much is the 2018 Chevrolet Camaro SS? A: The Camaro SS starts at $37,000. It basically gets the 1LT’s equipment plus a 6.2-liter V8 (455 hp, 455 lb-ft), a six-speed manual transmission with rev-match downshift (an eight-speed automatic is optional), 20-inch wheels, the four-piston Brembo brakes, the FE3 sport-tuned suspension, a mechanical limited-slip differential, a Track driving mode, a rear spoiler, xenon headlights and upgraded gauges.